This is a hand painted ceramic marble by Gregg Pessman. 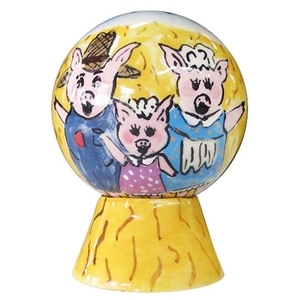 This marble features a farm scene featuring a family of three pigs on one side and a red barn on the other in a scene that wraps around the marble. Sits on a coordinating stand. Measures approximately 1 1/2" in diameter. Signed and dated 2014 by the artist. Fred Linders - "Blue and White Flower Marble"
Aaron West - "Vortex with Opal Center"